The award-winning Westin Savannah Harbor Golf Resort & Spa in Savannah is a luxurious escape in the historic and beautiful city of Savannah, Georgia. Located on the banks of the Savannah River–and just a 90-second ferry ride to the city’s vibrant downtown–the Westin Savannah is known for its signature Heavenly Spa and WestinWORKOUT® Fitness Studio, a PGA Championship Golf Course, spacious guest rooms and suites (featuring famous Westin Heavenly Beds®) and five unique restaurants and beverage venues. When you are a guest at this stunning waterfront hotel, you can spend your day poolside, relaxing at the spa, playing a round of golf at The Club at Savannah Harbor–or simply enjoying Savannah’s temperate climate. However, if you are looking for more adventures, the complimentary hotel shuttle will whisk you away to Savannah's historical attractions, dynamic restaurants and exciting nightlife. Plus, guests can book special excursions and explore Georgia’s coastal waters and beaches. This famed resort also offers a range of venues for breathtaking weddings and dynamic meetings. The Heavenly Spa by Westin, named a "Top Resort Spa" by Conde Nast Traveler magazine, offers a tempting menu of balance-promoting treatments, including luxury massages, holistic facials and aromatherapy body wraps, performed by licensed and highly skilled therapists. From Heavenly Body to Heavenly Massage to Heavenly Facials, every treatment is crafted to insure spa guests are mentally, physically and spiritually refreshed. You can also choose from a range of beauty services, including hydrafacials, waxing, treatments for your hands and sumptuous bath cures. The spa is open late and offers special Spa Nights with discounted treatments on every third Thursday of the month. The WestinWORKOUT® Fitness Studio features cycling classes with Peloton bikes and state-of-the-art Life Fitness® equipment. Personal trainers are also available, and there is a seasonal schedule of yoga classes, guided runs and group fitness activities. You can also explore Savannah on RunWestin™routes. And no worries if you forgot your gear: New Balance offers complimentary lending. There are countless amenities at Westin Savannah Harbor Golf Resort & Spa.Relish the views of historic River Street and the Savannah River. Relax at the gorgeous swimming pool where you can enjoy poolside beverages from the outdoor bar. 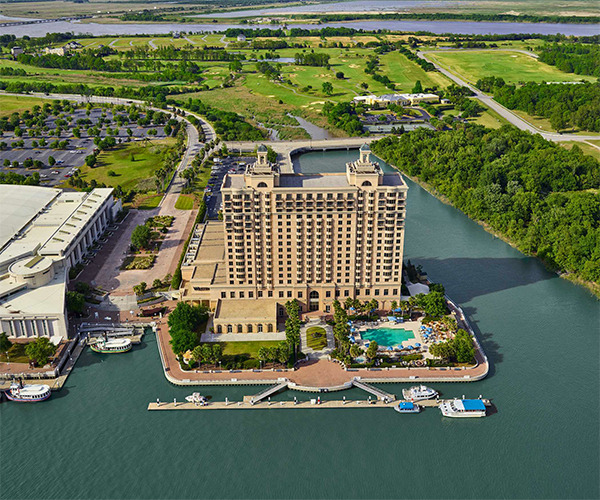 Enjoy golf and tennis at the renowned Club at Savannah Harbor. Unwind at the Heavenly Spa. Stay in shape with 24/7 access to the state-of-the-art Westin WORKOUT™ Fitness Studio. And discover the deep-water dock and marina just steps from the resort. Whether you’re a resort guest docking a small boat–or staying on your boat–you will have access to the award-winning amenities as well as the necessities for your vessel. The resort’s exceptional staff can also arrange special excursions and help you plan your ideal special event or meeting. Picture yourself in a river view room watching ships travel the Savannah River. Or imagine breathtaking views of Savannah’s historic downtown or the picturesque island and golf course. And to add to your haven away from home, the spacious rooms feature Westin Heavenly Beds® and Heavenly® Baths, Wi-Fi, flat screen TVs and access to spa and fitness amenities. In addition, you can choose from a range of sumptuous suites to fit your entertaining and accommodations needs. 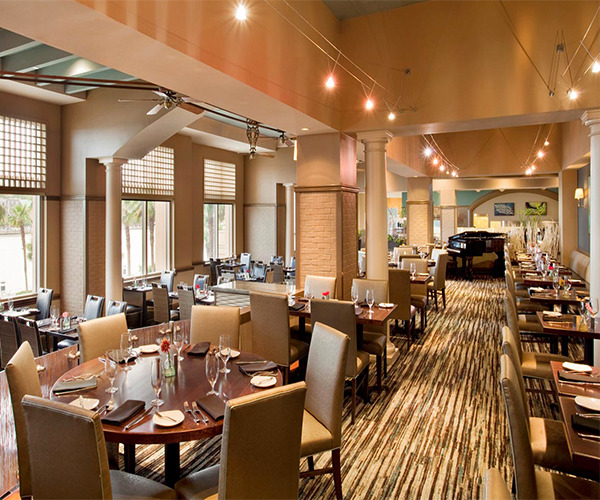 The Westin Savannah Harbor Golf Resort & Spa offers succulent Low Country or contemporary cuisine at five of Savannah’s best restaurants and beverage venues, conveniently located at the resort. These distinct and exciting locations include: The vibrant Aqua Star Southern Coastal Kitchen; the elegant and cozy Midnight Sun Lounge; the classic Champions Grill & Legends Bar, fun riverfront dining at the Escape Pool Bar & Grill; and the Aqua Fuego wine bar.